The snow is indeed melting...for now. We're sure to get another winter punch at some point soon, but for now, it's melting and the rivers are rising, giving way to flooding and ice jams. Stay safe, and take the main roads when you can. We are ready for Shop Hop! Vermont Shop Hop 2019 starts this Friday, and runs through Sunday, March 31. Yankee Pride has lots of fabric on the shelves, kits ready to go, and snacks to keep your energy up as you travel the state to all the other great shops. 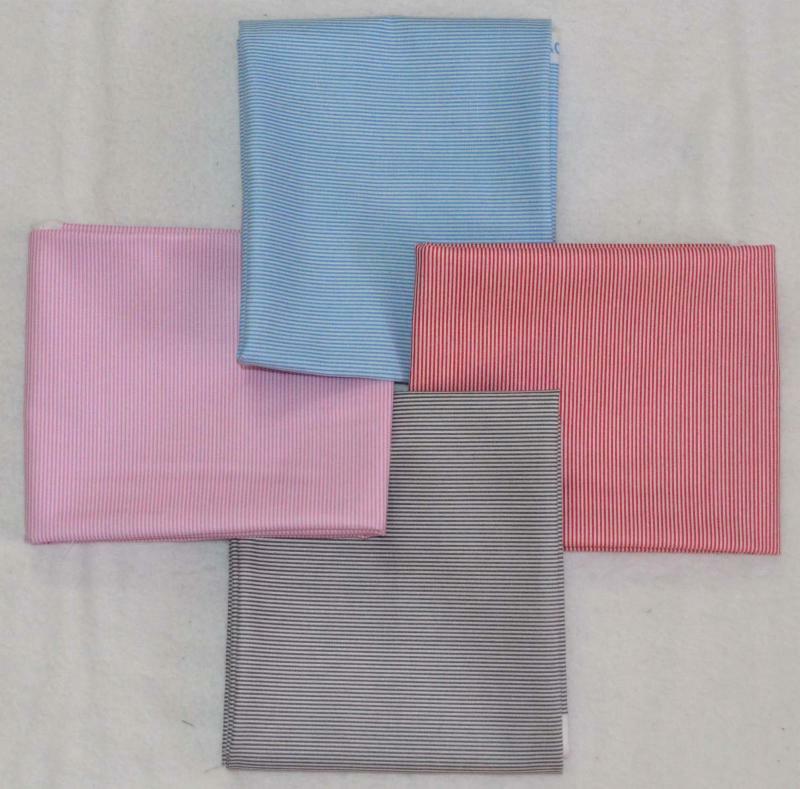 Each shop has its own vibe, and all our fabric collections are just a little bit different. Pick up a free original pattern, visit with the staff, and see what we all have to offer. We hope you have a wonderful time! See your passport for daily hours, and directions to all the shops. We look forward to seeing you soon! At last - Shop Hop is finally here! Grab your passports and your GPS, fill your gas tank, and get ready to roam the state in search of quilt shops from Derby to Wilmington. This year's Hop runs from this Friday, March 22, through Sunday, March 31. You haven't picked up your passport yet? No worries - stop in at Yankee Pride - we have plenty! This year's premium is the best one yet - free fabric! With the purchase of your Shop Hop passport comes one half yard of fabric - any one you want, as long as it's under $15 a yard. We'll keep our fingers crossed for good weather, and safe travel conditions. Here's a happy group of fabric - nice, bright 30s prints. Judy leaned toward the primary colors when she ordered this line. There are medium prints, and tiny dots - perfect to fit into your 30s stash. Isn't it time to make something? We've had enough of winter - let's think about warm, sunny days, and walking on the beach - this line will help you do just that! From the seagulls (top in photo) all the way to shells (bottom in photo), you've got what you need to chase the winter blues away. Make a pretty wall hanging to bring summer to your sewing room. Cindy's using the seagull print to make a small wall quilt commemorating her trips to the Outer Banks. Little tiny stripes can add a lot of interest to your projects. We've got a few new colors here. These are perfect for inner borders and bindings - the work is done for you! Judy ordered just a few bolts of new Kaffe - they can mix in nicely with the layer cakes and 6-inch rolls we got last week! We know a lot of you like to play with all Kaffe's bright colors. 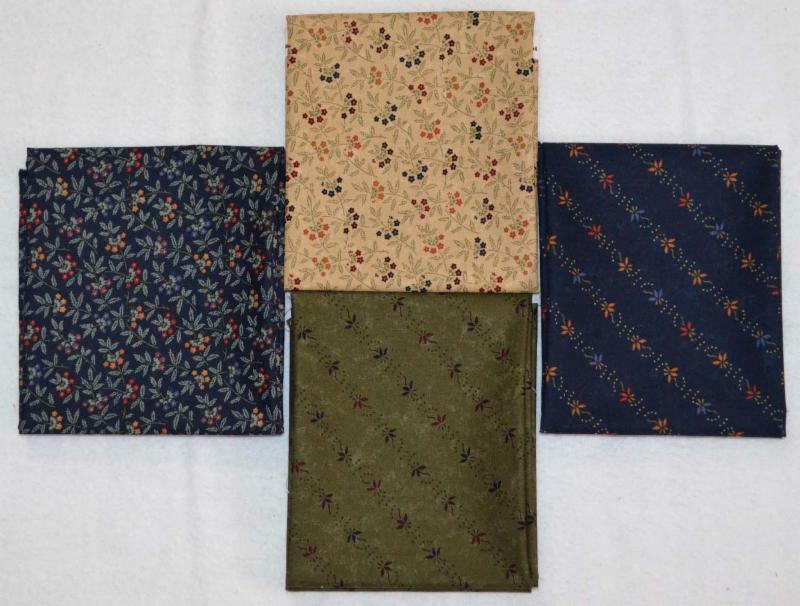 We have lots of Kansas Troubles fabrics, so Judy orders just a few pieces from the new lines, to go along with our inventory. These great prints may spur some inspiration to start a new project! 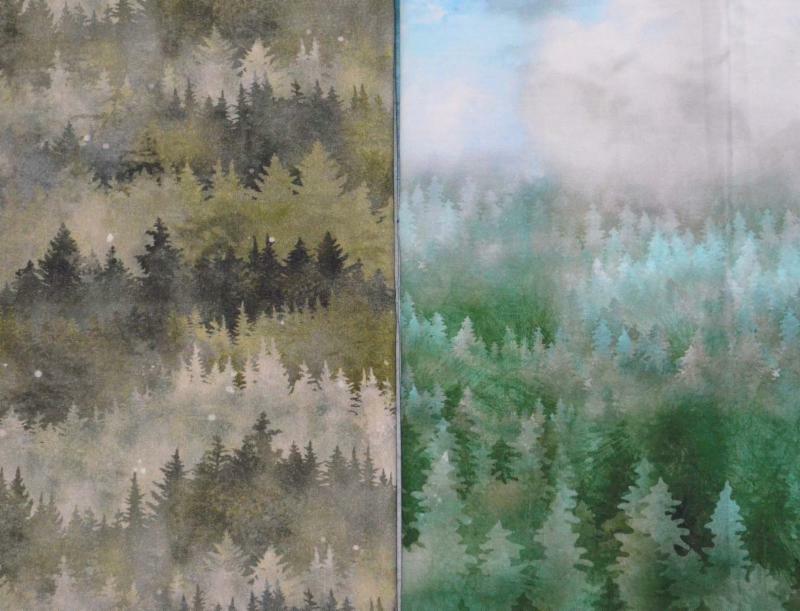 These stunning digital prints from Hoffman are from McKenna Ryan's new line. 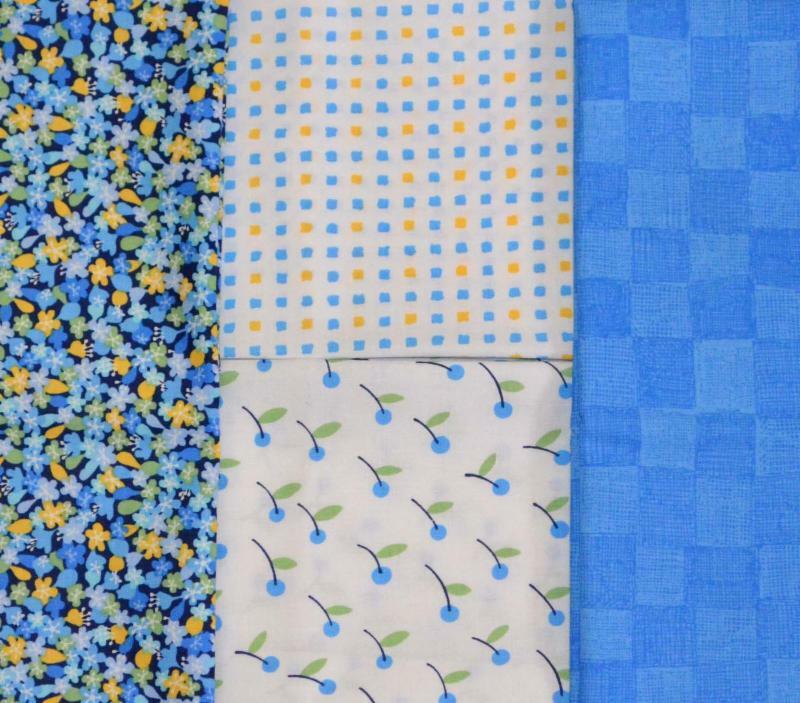 Her fabrics are so great for landscapes, and can also be cut up and used as details in other projects. This group actually comes all together. Originally a 2-yard panel, we cut them up and bundled them so you can actually see what's here. 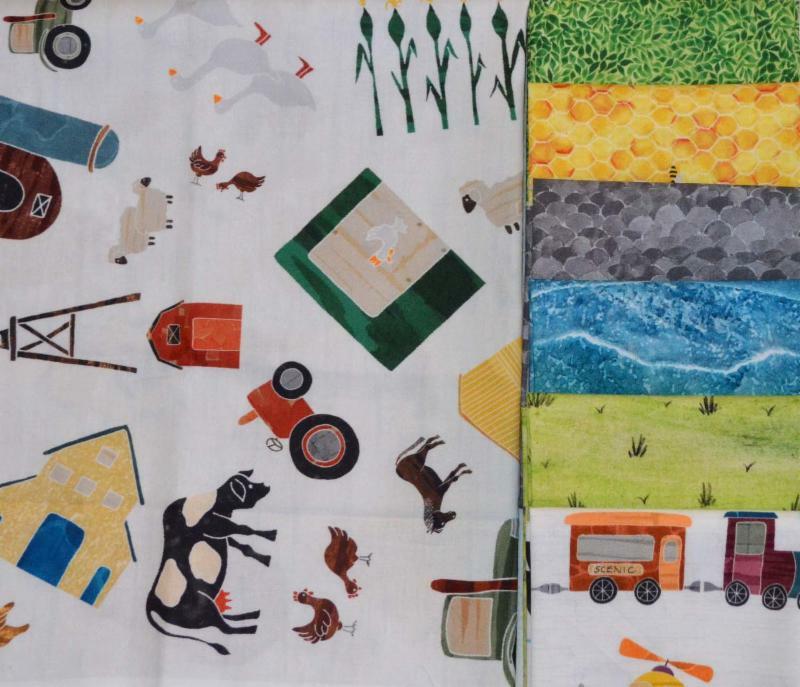 The bundle consists of one half-yard piece (the farm print), and six coordinating fat quarters (right in photo). 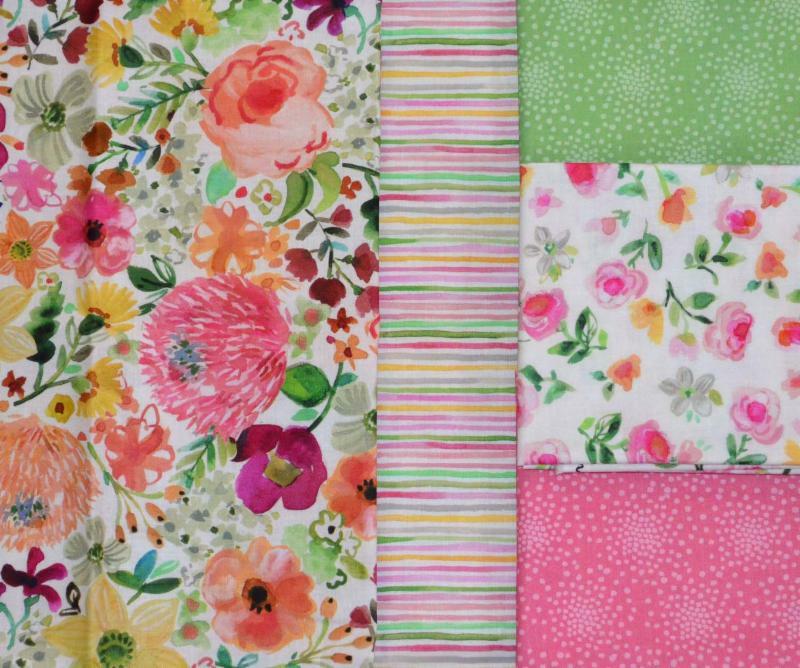 You can make a whole baby quilt top with just this one bundle! Such pretty blues make us yearn for spring. 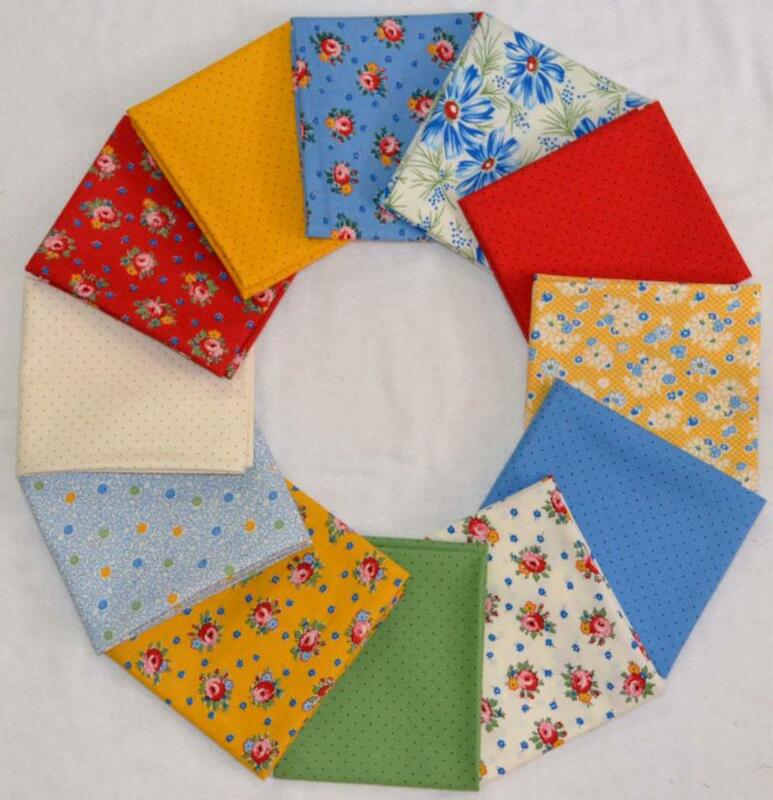 Make a pretty dress for a little girl, or placemats and napkins to brighten your table. We love the brightness of these prints! Wow - look at all the batiks that arrived this week! In our last issue, we got lots of greens - it appears that the blues came with this order. Are you ready for a new project? How about a brand-new bag for spring? 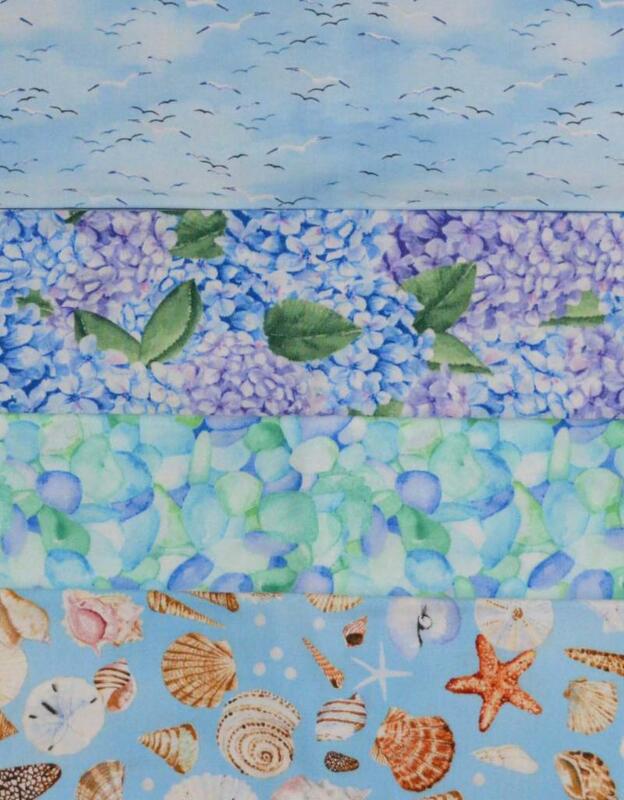 We saved the gorgeous spring prints for last, in order to make you smile. There are so many possibilities with this line! Quilts and runners and placemats and wall hangings and curtains and clothing and more. Will a "One-Block Wonder" work with the focus fabric (left in photo)? There's excitement in the shop for our Star Storm Mini class, and Victoria Findlay Wolfe's modern style has lots of fans, so Marti ordered another of her patterns - Tooth and Nail. This looks like quite a fun project! It makes a good-sized throw, and would look fabulous in batiks! On the other end of the spectrum, we got this great book on Reproduction-era quilts. 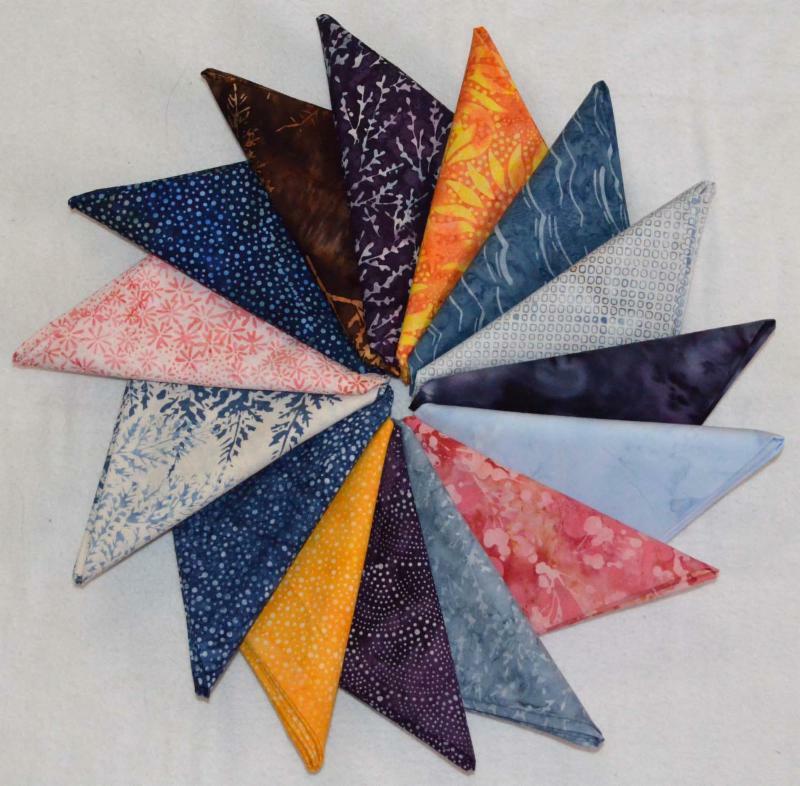 Step Back in Time, from Paula Barnes and Mary Ellen Robison, has 13 vintage-inspired designs, and true stories paired with each quilt pattern. It's always fun to learn a little history while we're quilting! Join our Aurifil Club before or during Shop Hop, and as a Club member, get 20% off your Aurifil purchases during the Hop! The spool of white and the thread case are a great deal at $14.99. It's worth the price even if you just want to store the Aurifil thread you already have! Don't wait too long, though - there are a limited number of cases available, and once we sell out, the Club will be full.